In the earliest days of this website, back when Handpan makers were few-and-far between, we were lucky enough to catch the earliest offerings of Swiss Handpan maker, Ezahn Bueraheng, of Echo Sound Sculptures, being tentatively showcased over at YouTube. And since those early days it has been quite the journey. With the instruments of ESS becoming ever more refined with each passing year. And ever more sought after. 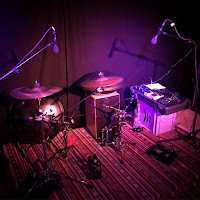 'Since we moved into our own EchoSoundSculpture facilities in Lenzburg, there was the vision to offer a platform for musicians and handpan lovers, to use this space for informal performances and workshops – and obviously the chance to connect with other musicians and handpan lovers. On selected Saturdays our workshop place in Lenzburg becomes a melting point of creativity, personal and musical exchange: At midday we start with a Jam Session, where everybody is invited to bring their instruments and inspiring ideas – Snacks are available as well as a bunch of AsaChans in different scales, that can be tried out. These days always end with an intimate concert of an international performer.' - From the ESS website. Catch more from the Living Room sESSions over at YouTube HERE, or find more information over at the ESS website HERE.